The United Kingdom’s Ministry of Defence (MOD) has signed a contract worth over £400M with MBDA for the Weapon Development Phase of the SPEAR air to surface, precision strike missile. This contract will further advance MBDA’s SPEAR weapon design and builds on a successful series of technical milestones during the preceding Assessment Phase. The contract will run through to completion during 2020 and will employ 350 highly skilled missile engineering jobs across MBDA’s sites in Stevenage, Bristol and Lostock, with an equivalent number of jobs in the wider supply chain. 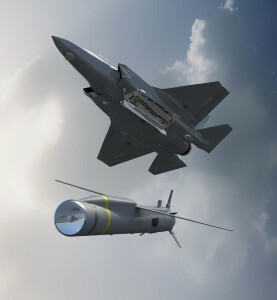 The SPEAR missile is being developed to meet the UK’s Selective Precision Effects At Range Capability 3 (SPEAR 3) requirement for the UK’s F-35 aircraft, with the option to equip the Typhoon aircraft. SPEAR will precisely engage long range, mobile, fleeting and re-locatable targets in all weathers, day or night, in the presence of countermeasures, obscurants and camouflage, whilst ensuring a safe stand-off range between the aircrew and threat air defences.